Puttur, April 9, 2015: K.M. Nataraj, a senior advocate who hails from Eshwaramangala in Puttur taluk is the new Additional Solicitor General of India (South Zone). He has been appointed to the post by the Chief Secretary of the Union Law Ministry as per the instructions of the President of India. An alumnus of Vivekananda College of Puttur, Nataraj was even the President of the District All College Students Union. 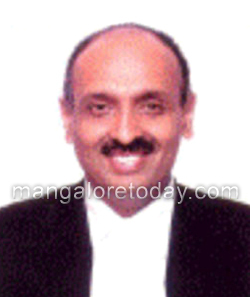 He later pursued his law education at SDM Law College and began his career as advocate at the JMF Court in Mangaluru. He has even served as Legal Advisor to Bengaluru Development Authority and has the experience of working under B.V. Acharya, a senior lawyer and former advocate general.